After Pangakent the road starts to undulate and valley landscapes open up either side of you as you pass villages selling apples and grapes, before snaking your way up the river gorge, where settlements are perched high above located by natural springs. 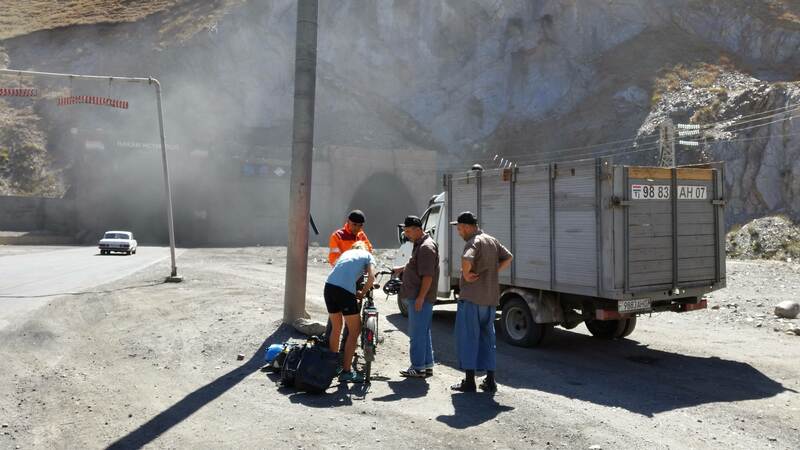 After meeting maybe 10 cyclists in the first 5 months of our trip from the UK to Azerbaijan we were now bumping into people daily! 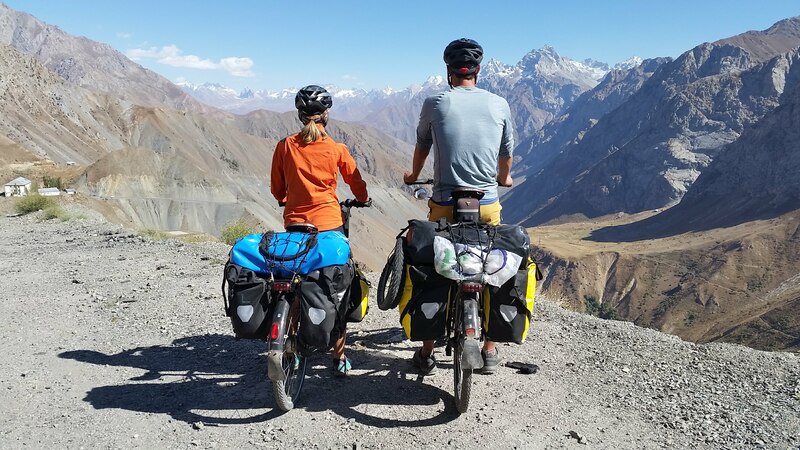 It seems like the season is not yet over, with plenty of people still heading to the Pamir which gave us hope that we weren’t the only mad ones trying to cross the Pamir HighHighway in October! It’s hard to believe it’s -10C at night up there when it’s currently a balmy 17 degrees at night here. 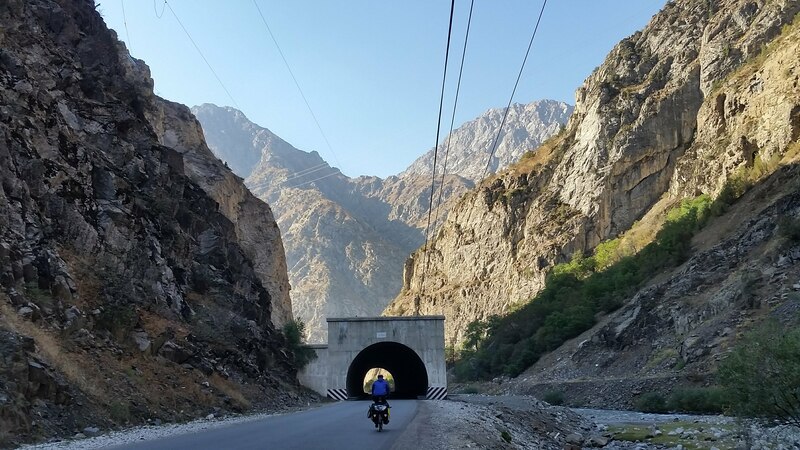 After battling a strong headwind from Ayni, we camped at Takfon below a coal mine before starting the long climb up to the Anzob tunnel, which sits at 2700m above sea level. The road up is good, and probably averages 7% gradient but made infinitely harder by the passing coal trucks spitting out fumes and dropping coal dust all over the road which blows back into your face each time a car passes. After that ordeal there was no way we were going to cycle through the 5km ‘Tunnel of death’ and so hitched a ride through. The tunnel is so named as when it was first completed there were no lights, tarmac or ventilation and the potholed surface used to flood regularly. The tunnel is now lit, but definitely not ventilated, you can see the fumes spewing out either end, and is dangerously narrow with just enough space for two cars to pass. Even with lighting we narrowly avoided colliding with a truck that had broken down in the middle! We were relieved to get to the other end and delighted by the mountain views that opened up in front of us. And breathe! The view on the other side. Another group of four cyclists appeared just as we were ready to leave, so we whizzed down the hill together and shared lunch - our first and last experience of plov. Plov is the national dish of rice/bulgar or other grain cooked with shaved carrots and usually meat. It’s a seemingly simple dish but ours was doused in so much oil and fat it was barely edible. With cramping stomachs it was a good thing the rest of the afternoon was downhill and we stopped shortly after to camp by the river. 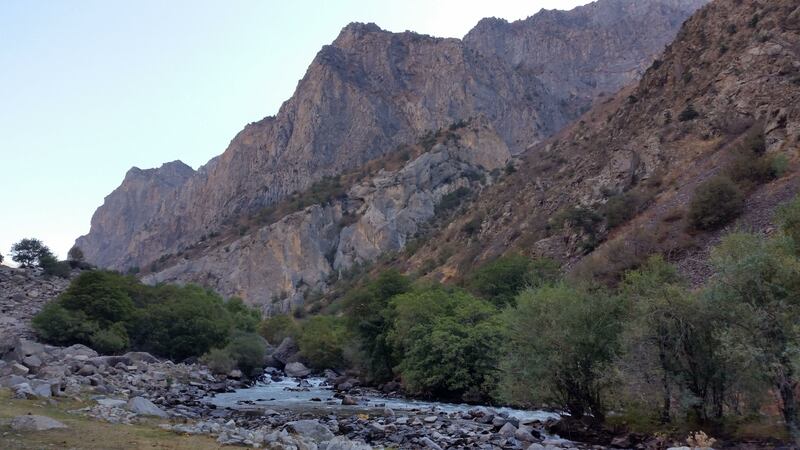 With so many farms and families near the road this was our first real ‘wild’ camp in Tajikistan, and it was bliss! The descent down through many shorter tunnels is much more fun! 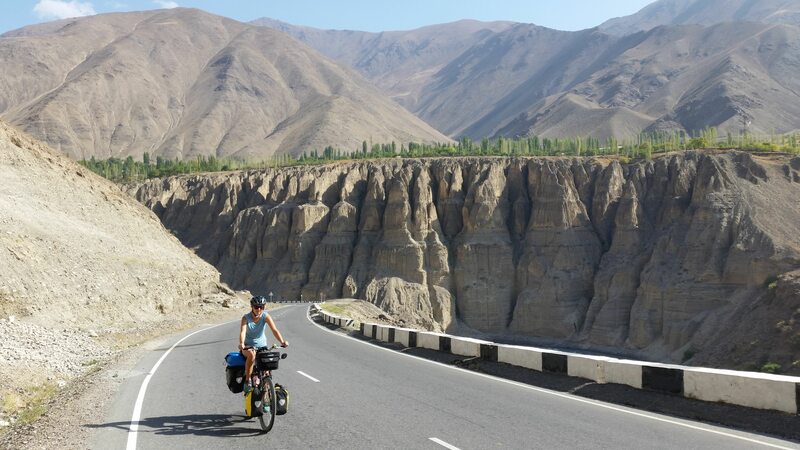 It’s all downhill to Dushanbe from here and the valley landscape is really stunning. Sadly though, it’s mired by the smell of petrol and coal. I’ve never been somewhere so beautiful and yet so polluted at the same time. The pollution gets much worse as you enter the capital city. For a brief respite we cycled through the Botanical Gardens where the largest national flag I have ever seen flies proudly in the middle. We stayed in the infamous Green House Hostel where we met many other cyclists and caught up with a couple we’d seen in Uzbekistan. There’s a great sense of community here and excitement for what lies ahead!